To enable a group to receive phone calls, set a group phone number for a group in PureCloud. When a customer dials the group number, PureCloud connects the caller with the appropriate agent based on the routing type that you designate. Group phone numbers are available for organizations with the Communicate license and above. To receive group ring alerts, group members need a DID number or extension assigned to them. For more information about how to assign a number to a user, see DID assignments or Extension assignments. Only official members of the group receive group ring calls. Official members of a group are PureCloud users whom an administrator adds to the group. Tn order to receive group ring calls, the owner of a group must be added as a member of the group. PureCloud does not alert a group member if their presence is Busy, Break, Meeting, Training, Meal, Offline, or Out of Office or if they have call forwarding turned on. Group members can see missed group calls in their call history. In the Group Details tab, toggle the Enable Calls slider to On and then click Edit. In the Group Phone Number box, type the phone number for the group. In the Extension box, type the extension for the group. To add a member to the group, click Add Person and begin typing the person’s name. Then select the name when it appears in the list. To remove a member from the group, click the X next to the person’s name. When a group receives a call, PureCloud alerts 15 randomly selected members simultaneously with a maximum of 1,000 members in rotation. If no group members answer, PureCloud continues to alert members in groups of 15 until someone answers, it has alerted all members, or the call times out. When a group receives a call, PureCloud alerts the first person in the list of group members. Use the check boxes to designate the sequence of the members. The member you designate as 1 receives all calls first. When a group receives a call, PureCloud alerts the next person in the list of group members after the person who received the last call. In the Rotate Calls box, select the number of seconds after which the next set of 15 randomly selected group members will be called simultaneously. Group members are alerted of incoming calls when they are considered available to receive them, based on their presence. There is no way to guarantee which group members will be or will not be called. However, PureCloud will not reselect a group member who was called in an earlier rotation. In the Stop Ringing box, type the total number of rotations that occur before the call is either disconnected or rolled to voicemail. The max ring time is dynamically calculated for you under the fields. If there is not another set of users to ring before reaching the full number of rotations, the call rolls to voicemail or disconnects. For example, if the number of rotations is 10, but there are only 30 available group members, then only 2 rotations occur. Then the call either rolls to voicemail or disconnects. The max ring time that appears below these fields is meant to help you determine the values of the Rotate Calls and Stop Ringing fields. However, it does not necessarily represent how long calls to the group actually ring. It depends on the number of available group members. Group members are available to take calls based on their presence. To designate a back-up group in case no one from the first group answers the call, switch the Back-up Contact toggle to On. Then type the first few letters of the group name in the list and select it when it appears. Note: If a call is routed to the back-up group, it is distributed as a broadcast call; it does not follow any other call handling rules that are already defined for the group. This ensures that it will be picked up as fast as possible. If no one in the back-up group answers the call, and if the original group has voicemail configured, then the call rolls to the original group’s voicemail. If the original group does not have voicemail configured, then the call disconnects. To enable voicemail for the group, switch the Voicemail toggle to On. After the maximum number of rotations occurs, if this switch is turned on, PureCloud automatically rolls the call to voicemail. If this switch is turned off, PureCloud automatically disconnects the call. 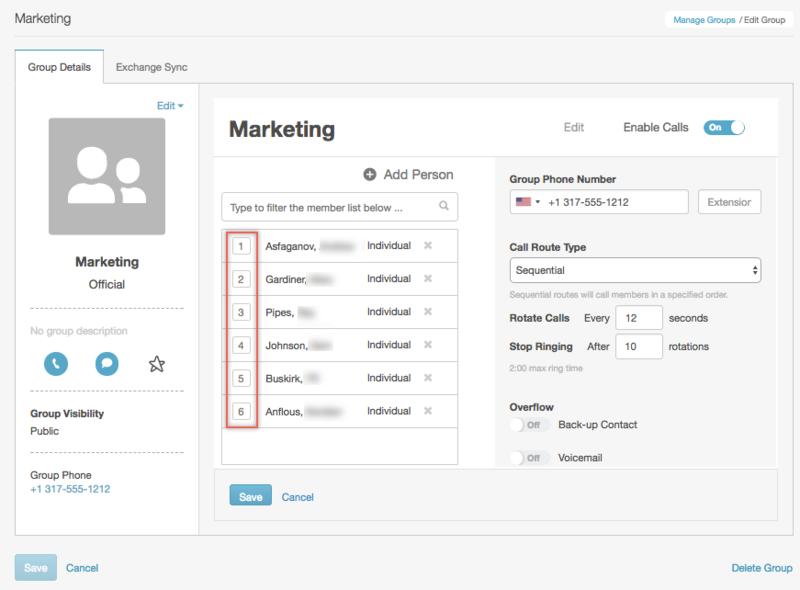 Official group members can check group voicemails through their existing inbox. For more information, see Check voicemail. When a group member acts on a group voicemail, it affects all group members. For example, after a group member listens to a group voicemail, it is no longer a “new” voicemail. While it remains in the group voicemail box, other group members do not hear the message that indicates that a new message is available. Likewise, if a group member deletes a group voicemail, then no other group member can access it. When you are finished, click the black square. To listen to your recording, click the black triangle. To upload an audio file, click Options. Then click Upload an audio file and select the audio file to upload and click Open. Note: You can upload only .ogg files. To reset a custom greeting to the default greeting, click Options. Then click Reset to default. To send all group members an email notification when a new voicemail is saved in the group’s voicemail box, set this switch to On. To exclude a group owner from receiving email notifications, deselect the Include owners option under General Information. If your organization is HIPAA-compliant, then this option is unavailable. The group phone number appears in the group contact information.